to livestock, poultry, and fish on industrial farms. 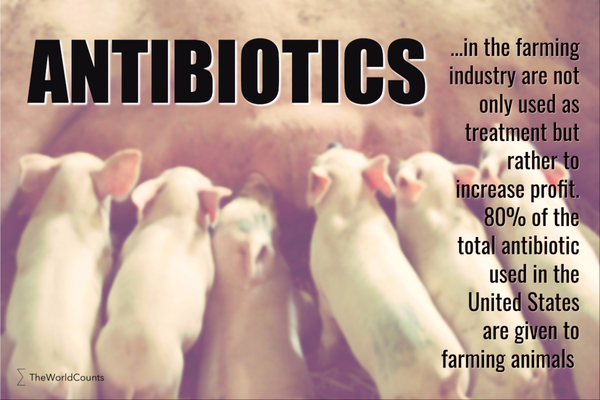 80% of all antibiotics used in the United States are fed to farm animals. Antibiotics have become routine to feed farm animals to increase the weight of the animals and thereby the profit. It is also done to compensate for the poor conditions the animals are living in. But why not give them better conditions of living? Since the 1980 the use of antibiotics added to feed for industrial livestock production has exploded. In the United States from 1985 to 2001, antibiotic usage rose with 50% - only in poultry production. As many as 80% of the total antibiotics used in the United states are given to farming animals. Since 1946 industrial farms have been using antibiotics to livestock feed. This was done to increase the profit for the farmers as studies showed the animals gained weight more efficiently and grew faster. However, new research showed that the net profit is actually negative as the cost for antibiotics are higher than the profit on the animal. Many of the pigs in the conventional piggeries have the MRSA (Methicillin Resistente Staphylococcus Aureus) bacteria and mainly due to antibiotics in their food. Conventional pigs get as much as 20 times more antibiotics compared to organic free range pigs. Furthermore, conventional livestock live in poor conditions such as confinement and close proximity. Their stress levels rise and these conditions inhibit the animals' immune defense. And so the likelihood of infections developing and spreading are much higher than in free range animals. According to the Danish Food and Drug Administration, 88% of the pigs in conventional piggeries carry the MRSA bacteria, whereas in the organic piggeries the percent is as low as 6%. Danish investigations now show that the MRSA bacteria might be air-born and when pigs have access to fresh air they can get rid of the bacteria, reduce the risk of infections and the MRSA bacteria to spread. The Difference Between Antibiotic and Antimicrobial Resistance? Antibiotics are medicines used to prevent and treat bacterial infections. Antimicrobials are used in a broader term and can be used to treat diseases caused by other microbes such as parasites (e.g. malaria), viruses (e.g. HIV) and fungi. Antibiotic resistance occurs when bacteria develop resistance towards the drug they are exposed to due to a mutation in their DNA. These bacteria may infect humans and are much harder to treat than non-resistant bacteria. Interested in more facts like the antibiotics used for livestock? Then plug in and subscribe to our newsletter.